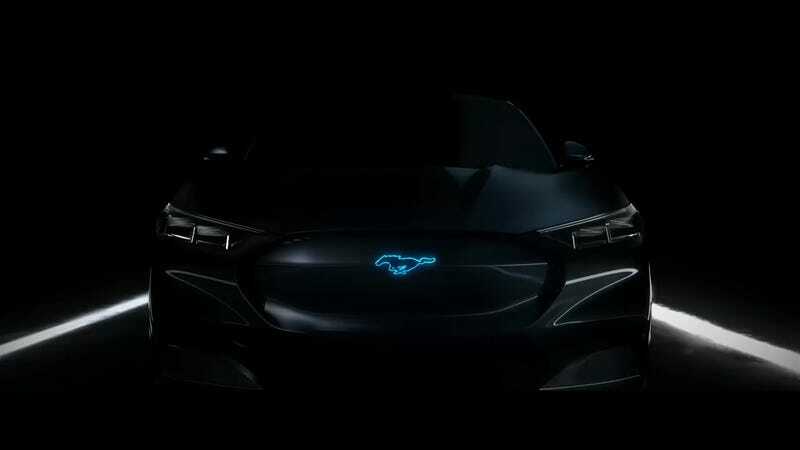 We know a hybrid Ford Mustang is coming, and we know a “Mustang-based” electric crossover is coming that’s maybe called the Mach 1, and it’s very possible the face of one of those cars was just revealed in Ford’s new ad campaign. It shows a car, we know that much, with a Mustang emblem over a solid fascia that doesn’t appear to have a traditional open grille. That would suggest it’s probably electrified somehow. “Electrified” being the industry term for “let’s call everything with a battery in it “electrified” so that our hybrids sound more like fully electric cars. We know the hybrid Mustang is due by 2019 with equivalent power to that of a V8, and SlashGear seems confident that what we’re looking at is that coming car. But you would think a hybrid Mustang would just look like a Mustang from the outside, and still need a traditional grille for the combustion engine. So maybe this isn’t a hybrid Mustang. While the car in this teaser looks muscley and powerful, it looks too tall to be a sports car. We know Ford is also working on a “Mustang inspired” crossover it tried calling the Mach 1, which is supposed to be fully-electric. That’s makes the lack of air-holes and taller profile of the car in the teaser seem more like it could be this Mach 1 thing, instead. We’ve reached out to Ford to find out what the hell we may be looking out and will update if we hear anything. If this is the Mach 1 crossover, I really don’t see why it needed to drag the Mustang into this. As a colleague pointed out, it just kind of looks like a Buick.